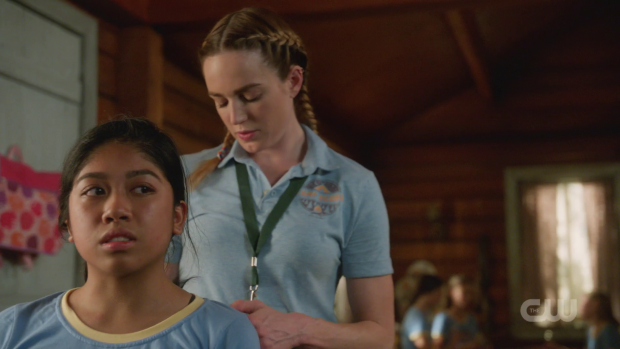 Kneel Before Blog - Legends of Tomorrow - "Wet Hot American Bummer"
DC’s Legends of Tomorrow heads to the 90s for a summer camp adventure to solve the mystery of disappearing kids that spawned a franchise of schlocky horror movies. There’s a reason I prioritise this show over any other show I have to review that day. That reason is the sheer entertainment value attached to pretty much every episode this show has produced since it got out of the difficult first season. DC’s Legends of Tomorrow knows what it is, knows where its strengths lie and isn’t afraid to lean into some fairly ludicrous plots. For the most part it works because the writers know how to deploy the characters in ways that take full advantage of whatever insane premise an episode is based on. Sending the team to summer camp as Camp Councillors might seem ludicrous to those uninitiated but the writers manage to use this to get the best out of the characters. This is accomplished by taking advantage of pairings that both compliment and enhance the individual characters. I’m told that Summer Camp for American kids -we don’t really have this in the UK- is something of a rite of passage where they learn important life skills ranging from structured survival techniques to pre-teen misbehaving. Both are important for development and the writers can take full advantage of how important that is by connecting the characters to it. Sara and Ava are an obvious pairing in this instance but not for their relationship though that becomes part of what makes their contribution work so well. Sara has fond memories of Summer Camp as a kid as shown by her waxing lyrical about how much she loved it. Considering all the pain and darkness in Sara’s life it’s refreshing to see her dredge up a happy memory and revel in that for a while. Ava never had a real childhood as all of her memories are fabricated and she knows that so there’s more than a hint of resentment of the situation on her part. The characterisation here works brilliantly because Ava is immensely frustrated by the situation and Sara isn’t able to fully appreciate it because she’s too busy enjoying the experience. Her major character flaw in this episode is that she is accidentally insensitive because she forgets that Ava didn’t have any real childhood experiences. This background informs how they behave. Sara is eager to enjoy this mission by fully immersing herself in the experience and becoming “one of the girls”. It’s almost a sense of regression which makes sense for Sara as she spent so long consumed by darkness that latching onto more positive memories must be really comforting for her. Caity Lotz fully commits to the sense of fun in her performance making her a delight to watch. Ava sticks to what she knows; stamping her authority. She clashes with Sara on how to run this mission as she feels all the fun will be a distraction from the hidden danger. She’s not wrong though her approach is counter intuitive since the kids clearly respond better to Sara than Ava. Ava’s inability to grasp the best approach to dealing with young girls is a character flaw born out of her lack of childhood and the insecurities that come with that. She’s unable to get into the mindset of a pre-teen girl because she has no baseline for that in her personal experiences so she acts in the only way she knows and struggles to get results because of that. Once Sara realises that she’s acting insensitive she shifts gears into being the supportive partner that Ava needs. The requirements of the plot have them drink a de-ageing potion so that they can gain the trust of the girls by literally engaging them on their level but from a character standpoint this is Sara giving Ava a taste of childhood and being there with her while she experiences that. It’s really poetic and deepens their connection in profound ways. Emily Murden and Vanessa Przada do a serviceable job of playing younger versions of Sara and Ava respectively; they are especially good at carrying the emotion of the moments the share together especially the prelude to Ava’s first kids as a child. John and Ray make for an engaging pair because they are so delightfully mismatched. Ray is as straight laced as they come and has fond memories of all the learning he experienced at Summer Camp as a child. John is the effortless rebel who is initially defined by his impatience with the whole situation. He becomes part of the team in a very real sense by dressing the part to blend in with the surroundings, something he clearly detests. John not being a team player and constantly complaining about having to play the part of a Camp Counsellor would probably have been enough to make this episode entertaining but this story manages to affect John on a really personal level as the case involves missing children. It has been previously discussed that he lives with the regret of a bad decision made years ago that resulted in the soul of a young girl being condemned to Hell so children are a trigger for him. He goes from being frustrated by the situation to fully invested in solving the problem because he has a personal interest in making sure children come to no harm. This is further evidence that John’s abrasive and detached demeanour is a cover for a great deal of pain that he hides from the world. He is motivated by a desire to do good and protect people which makes him a perfect fit for the team. Of course there’s still plenty of cynicism on display particularly around his views on Ray being hung up on Nora Darhk. John has made up his mind that she is irredeemable and constantly calls Ray out on his feelings to the contrary. He sees parallels to himself within Nora and warns Ray that trusting her will lead him to a bad end. He talks about someone trusting him in the past and how disastrously that turned out so he assumes the same applies here and that Ray will end up regretting his decision in the worst possible way. Ray is as ever the beacon of positive thinking and believes that when Nora is encountered again he will be proven right. What actually happens remains to be seen but based on the end of the episode it won’t be long until we find out. The episode doesn’t really have any connection between Ray and the mission in the same way the other characters do but that’s sort of the point. Ray fits the role of a Camp Counsellor brilliantly because of his earnestness and belief in everything they represent. This pays off for him when the survival skills he teaches them are made use of in a really satisfying and hilarious way. Once again Ray’s value to the team is confirmed. Mick and newcomer Charlie make up the last pairing. They are connected through their common experience of being in prison which allows them to bond in ways others on the team couldn’t. Even though Charlie spent an extended period of time in a mystical prison the experience seems to be universal enough that Mick understands exactly what she’s going through and is able to offer her his own perspective on transitioning from that to being part of the team. He talks about having a partner that he trusted and lost before deciding that he had a place among this group of misfits. He suggests that she could also find a place among them which leads to Charlie deciding to try her hand at being one of the team. Hijinks will likely ensue. This makes for a rare moment of introspection from Mick who often comes across as more of a comedic foil to the rest of the team rather than an integral part of it. Plots like this serve as a reminder of how important he has become to the show and how it would feel like something was missing if he wasn’t around. Belonging is the basis of his interaction with Charlie and it’s abundantly clear that Mick belongs here. Zari is on the fringes of this story as the one guarding Charlie early on though doesn’t relate to her quite as strongly. She has the experience of finding it difficult to find her place on the team and is further along in a journey that Charlie is just beginning. There are some weaknesses to the episode such as the underwhelming villain complete with an obvious red herring. Chad (Mason Trueblood) just doesn’t stand out when compared to the murderous Unicorn or the Fairy Godmother. Even though the climax of the episode is exciting to watch because it has young Sara and Ava fighting his true form intercut with Ray and John rescuing the kids it doesn’t have the impact that it should because the villain doesn’t have enough time to be properly developed. It was absolutely the right thing to focus on the character pairings and make sure they all work but it means that the urgency of the threat dissipates fairly quickly because there is too much time between incidents. An excellent episode that makes near perfect use of natural pairings in order to further the characters. Sara and Ava are always a natural team but this episode brings something extra with Sara latching onto one of her more positive memories as a contrast to being consumed by her darkness and Ava feeling insecure because of her lack of childhood. Ava sticks to what she knows and tries to stamp her authority on the young girls which is to her detriment and Sara has a built in flaw when she is accidentally insensitive because she forgets that Ava’s childhood memories are fabricated. 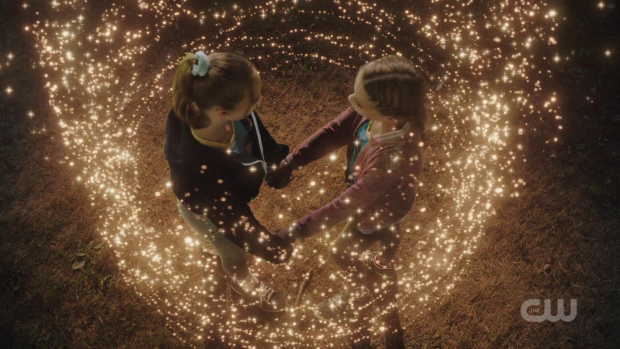 Having them turn into children through magical means is a great addition because of the poetic idea of Sara giving Ava a childhood that they can share which ends with her first kiss as a child. Ray and John make for a great odd couple pairing with Ray imparting conventional wisdom on the kids that pays off in a satisfyingly hilarious way. John finds himself personally connected to the case because it deals with missing kids and children in peril is one of his major triggers. The discussion they have about being able to trust Nora is interesting as well and clearly shows how little John thinks of himself. Mick and Charlie bonding over their common experience of being a prisoner works brilliantly as well as it offers insight into the mindset that keeps Mick with the team while giving Charlie something to think about before trying to find her place as well. Zari is slightly connected to this but it isn’t really explored. The episode suffers with a lack of real focus on the threat. Giving the bulk of attention to the character pairings to get them right is definitely the right thing to so but any urgency associated with the villain all but disappears though the climax is satisfying enough in terms of how it’s staged.